The task of orienting the maxillary cast is often given to the dental laboratory technician. The clinician usually has little awareness as to how the maxillary cast is technically mounted and often assumes it is being done correctly. In reality it is commonly being manipulated to position by the lab technician in the plaster room often with no accurate record or registration to go by. It is the lab that is deciding the maxillary cast orientation and mounting position. More often than most it is not the clinician. I see this as a huge problem for those clinicians wanting to take their cases to the next level. If so they need to take control and give the lab technician an accurate reference to mount the upper cast each and every time. In order to implement this simple technique it is imperative that the cervical neck is stable, if not the leveling of the Fox Occlusal Plane will challenge the clinician. This is what I do! To orient my maxillary dental cast correctly as it relates to the patient’s head orientation at level, I simply use a Fox Plane and a flat mounting table. Sophisticated simplicity! My lab technician loves it’s simplicity and accuracy. Step 1: I record the maxilla’s orientation in the patient’s mouth using Dentsply’s Trubyt Fox Occlual Plane. It is very simple! With the patient’s head at level (eyes looking straight ahead at the horizon), I like to have the patient standing, I use a 30 second set Polyvinyl (PV) bite registration material and inject it on the bite fork. I then place the bite fork of the Fox Plane up against the anterior teeth keeping the Fox Plane level to the ground and level to the patient’s leveled head. I do not press the PV Fox Plane up against the upper posterior teeth. If you do you are screwing up the occlusal plane indexing (OPI) record for your maxillary mount. Only the anterior central teeth should penetrate the PV material on the bite fork. From the frontal view the Fox Plane is perpendicular to the long axis of the face. (I do not reference to asymmetric eye levels, neither distorted ears levels, but rather observe the overall long-axis of the face to establish a perpendicular level frontally). From the sagittal view I use an imaginary line from the corner of the eye (exocanthion) to the connecting line of the temple of the head and base of the anterior portion of the earfold (I call it the temporal helical fold). From the sagittal view I want this line level/parallel to the ground. The Fox Plane is also leveled parallel to this imaginary line when capturing this maxillary orientation record, I call the OPI – Occlusal Plane Index. Once it is set, I check for levelness both frontally and sagittally and remove it from the patient’s mouth. Step 2: I peel the set PV index from the Fox Plane bite fork and position the OPI to the flat mounting table, positioning it flat againsT the flat table in the anterior and middle of the table. [Any flat mounting table fitted to any articulator will work. There are a number of articulator companies that offer these tables (a growing trend in articulation it seems) and any table will work. I use Ivoclar’s Stratos 200 Semi-Adjustable Articulator fitted with the “Flat set up table” and “Instrument carrier” (Stock #536394 and #536399)]. Step 3: Orient the maxillary cast into the PV OPI recording your took using the Fox Plane and mount the upper cast with mounting stone. You can stablize the OPI and stone cast with hot melt glue from Home Depot. It works great! Just wet the model first and blow dry the surface dampness quickly with compressed air and mount. Note: The natural occlusal plane slant is simply transfer from the mouth accurately via the Occlusal Plane Index (OPI) record with fast set PV bite registration. (Read more to see the corresponding lateral cephalogram on “What Angle is the Occlusal Plane to the Horizon?) The maxillary cast mount is not accurately duplicated. Now you have the maxillary cast mounted to level just as it was in the patient’s mouth, with patient’s head at a level position. Pretty simple! Anybody can do it! Most of you dentist all have a Fox Plane from dental school! Pull them out and use them. Your Lab Technicians will love you for this. 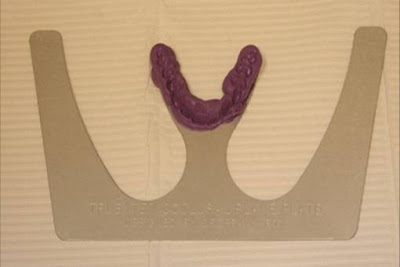 If you don’t want to mount the upper cast yourself, then simply remove the PV OPI record from the Fox Occlusal Plane and mail it to your technician of choice. There are no moving parts to distort, more or shift during transportation or shipping to the lab. Make sure you send a frontal view photo of your patient so your lab can confirm the mounting visually. For those clinicians not familiar with a proper head position and occlusal plant slant, what would appear as not natural may in actuality be physiologic once one learns what a proper head position is and how the position of the mandible effects head positioning and head tilt. Controlled studies have shown a normal “physiologic” occlusal slant is 6-14 degrees and not flat as many believe. Remember: If you are having difficulty in keeping the head level while recording the occlusal plane via this Fox Plane technique perhaps you may want to reconsider whether your patient’s cervical neck posture is truly stable. An unbalanced cervical aligment will effect occlusal/mandibular stability. If you would like to read more on the rationale, science and reasons why I choose to mount my complex cases in this simple way you can read my article “A Clinical Significance of the Occlusal Plane”.